Loved this post – we should all be more playful and enjoy life ! A truly creative week. The ideas are flowing. The needles have clicked. Thread was stitched, by hand and by machine. Work must have stemmed my creative juices – currently between jobs and I just want to knit, to sew, to play with yarn and fabric! I am so lucky to have the time to do this. Not everything has worked out, but it’s been fun all the way. And embroidery hoops with stitched pictures – a Tea Shop theme – as they will soon be available in a local tea shop for sale. NaKniCromo – on Ravelry, again a little late with the update. This was an interesting challenge to follow, updates to fellow Ravelryers here. This is a project for March and March is soon over. Day 21 – Share my progess. Well, If you take about 4 inches off the Top Down above then that would have been my progess on that project on Day 21! Day 22 – Favourite colour to work with. Looking at my stash it has many shades of purple and teal and I currently have one teal knit project on the go. Guess I’ll say those two then! Day 23 – Favourite type of project – ones that grow fairly quickly and keep me interested. Over the last few months, definitely a baby blanket with a ripple – as blogged previously. Day 24 – Fave project ever made – a teal short sleeved button front cardigan for myself. I used Rowan Aran Tweed, made it too short to start with, added an extra band along the bottom to make it long enough. Loved it. Wore it often. Washed it poorly once and shrunk it. Boohoo! Day 25 – today – Favourite yarn to work with? I don’t have one. I was sorting through my stash this week, donating things to charity, ebaying others, planning what to make next – and came across a cotton/linen yarn from about 10 years ago – it was an oatmeal colour, nubby, absolutely dreadful on the hands to knit with – I remember it made me so saw, thus just a quarter of a top was finished and was in with the bag of unused balls ! 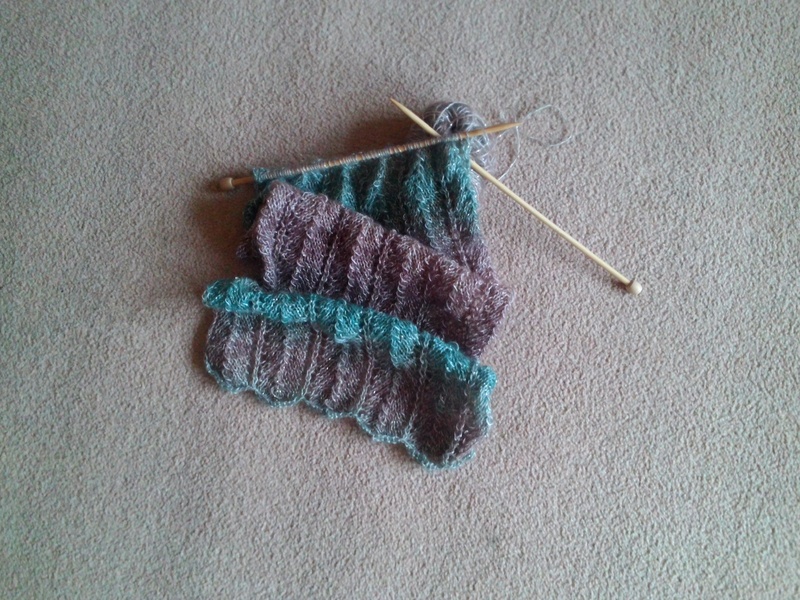 So for Day 25 – I turn it round and say ‘worse yarn to work with’ ! Day 26 – tomorrow – wonder what it will be – Projectless yarn I have held on to . Well, there are several stories! Goodbye for today, from a very blowy but sunny Kent in the UK. Happy Crafting!